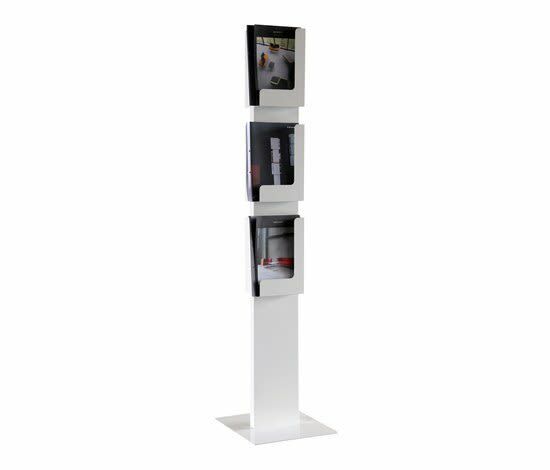 Case magazine/brochure holder is available as wall mounted and as freestanding versions. In Case, form follows function: The minimal, stylish design gives the products a strong architectural impression. The similarities in form language and design of the Ad Case versions is easily recognized but, compared to the magazine holders, there is a big difference in use. The main focus in the new brochure holders is to keep a maximum area of the brochures visible, giving out as much information as possible. The main idea behind the magazine holders is on the other hand to hide as much as possible of the restless front covers making interiors look more peaceful. Like the magazine holders, the new brochure holders should also be seen as a part of the surrounding architecture. Case looks good in single units or in bigger dynamic groups. Material: Epoxycoated steel. Standard colours: black, silver and glossy white. Inno was founded in 1975 and started by importing high quality design accessories to Finland.